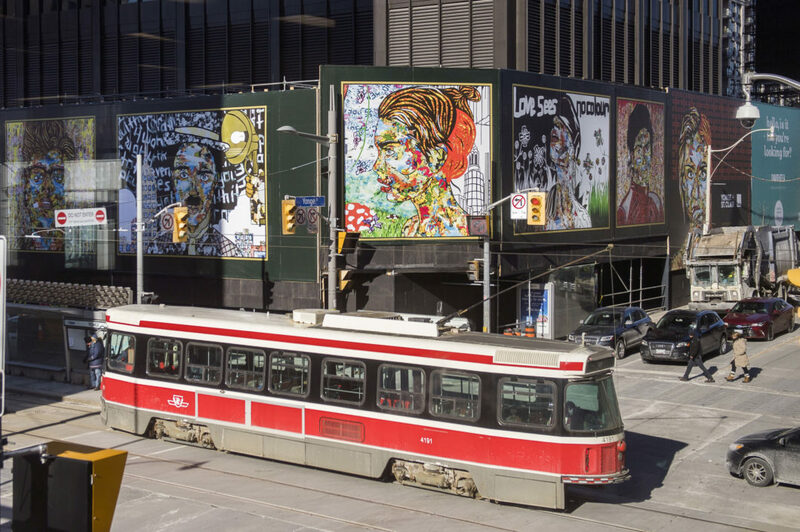 Described as the next Andy Warhol by the Toronto Star, artist Daniel Mazzone is currently leading the artistic charge here at Yonge + St. Clair with an interesting large scale mural. Using images of his icons, Daniel has created a mosaic collage that will span two entire levels on the north west corner of Yonge + St. Clair. Helping to transform the four corners during the upcoming construction for the new concept restaurant from Buca, pedestrians will be able to experience a unique art form that has become his signature look. We took a few minutes to chat with Daniel so we could learn more about his work and how it came to be. How did you get into art and were you always hoping to be an artist? I come from an artistic family, my mother was an art instructor and I became really interested in the composition and production of stained glass at a young age. I used to be a mortgage broker, but in 2011 I quit my job to purse what I was really passionate about – art. What are some recent projects you have been working on? I worked with the W Hotel in Miami Beach to put up large-scale prints of my work in their nightclub – Wall Lounge. It was intended to be temporary for Art Basel, but the response was so positive that they want to keep it permanently. The prints are 40 feet by 30 feet. Your art has a very distinct look to it, what is the medium you use for your pieces? All my pieces are collages. I rip up pieces of paper and other printed materials that I find and glue then on wood. For example, the Michael Jackson piece featured on the hoarding was created using pieces of his music albums, magazine interviews, and other memorabilia. How long does each piece take you to complete? 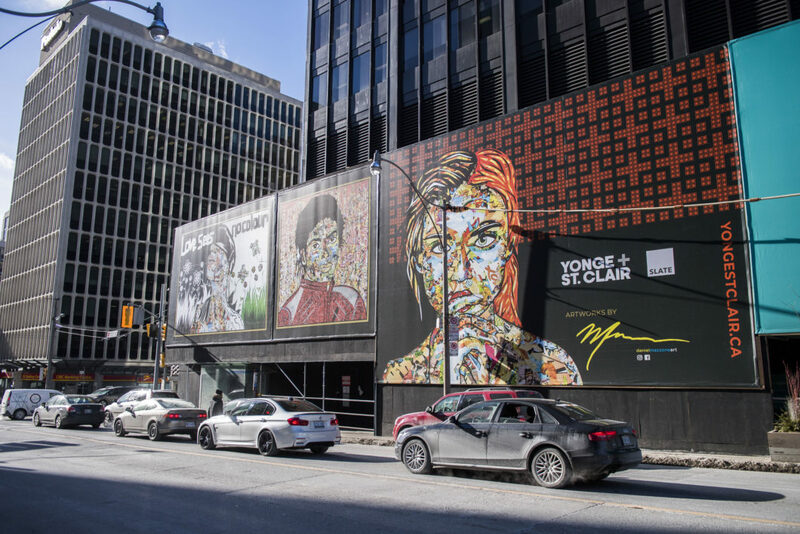 Tell us more about the Yonge + St. Clair hoarding and how that came to life. The hoarding features a few of my works that were photographed, resized to be large-scale and then printed on vinyl. James Dean, Michael Jackson, and Charlie Chaplin span the entire hoarding that you can see from Yonge St and St. Clair W. I am really looking to do more street art and large-scale mural work. This would be my first project of that nature and I’m very pleased with the way it turned out. I choose these iconic people because they are people who had a tough life like myself and made it through the trenches and followed their dreams. My studio is my gallery, 55 East Liberty Street, and I am reachable via email. To contact Daniel, or to view more of his work, you can visit his website HERE.